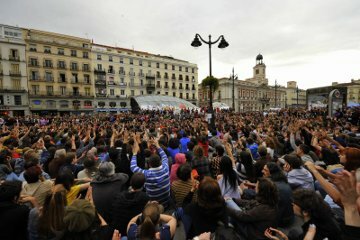 On 15th May 2011, a number of citizens of different ways of thinking started a non-partisan political movement known as 15M. In the wake of the demonstration held that day, and quite spontaneously, we decided to camp out in the streets and squares of our city, both in visible repudiation of the political and economic situation that is becoming more unbearable by the day, and as a means of organising our efforts to find a better way together to make a world. Over 50 cities in Spain sprang up to join the movement, establishing camps throughout the country, and focal points of support appeared in many other countries. We’re no longer camping out in town squares everywhere, however: instead, we’re meeting in the hundreds of neighbourhood assemblies that have been established since. We are not represented by political parties, associations or trades unions. Nor do we wish to be, because we believe that we the people can decide for ourselves. We want to think amongst ourselves about how to build a world where people and our natural world take precedence over economic interests. We want to come up with the best world we possibly can. Together, we can and we will. Fearlessly. 2. 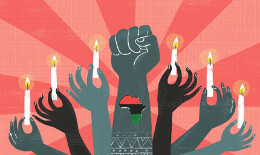 Why did we take to the streets? The call us “los indignados”, indignant citizens who have had enough, and that’s what we are. We’re tired of being treated as newspaper fodder, statistics, potential consumers; we’ve had enough of being commodities for politicians and bankers to deal in. We’re aware of having a vote but no say in what goes on, and we’re frustrated at politicans’ unwillingness to devise mechanisms for direct participation in the decision-making process. Mechanisms to put an end to corruption and the absence of transparency in politics and public institutions, to put the citizen before market forces and private interests. We fail to understand why we should have to pay the costs of the crisis, while its instigators continue to post record profits. We’re sick and tired of one injustice after another. We want human dignity back again. This isn’t the kind of world we want to live in, and it’s we who have to decide what world we do want. We know we can change it, and we’re having a great time going about it. We took to the streets and squares for the same reasons that other citizen movements did in Iceland and the Arab Spring countries, and for the same reasons that people in other countries will. We act locally, but we think globally. Our planetary problems require planetary solutions. We’re creating… human and digital networks that give rise to new forms of collective knowledge, honing our increasingly effective analytical skills and furthering our joint decision-making mechanisms. We’re the world’s collective intelligence, in the process of organisation. We’re developing… new ways to organise, interact and live. We’re combating the stasis induced by the system and pursuing ongoing development and improvement, active participation, reflection and analysis, decision and action. 4. How are we doing all that? We’re reclaiming and using public space: we’re taking to our cities’ streets and squares to meet and work together, openly and visibly. We’re informing the entire population about our aims and inviting everyone to join us. We’re discussing problems, seeking solutions and calling citizens to action and demonstrations. Our digital networks and tools are all open-source: all the information is available on line, as well as in our streets and squares. We’re organising around assemblies, reaching decisions openly, democratically and horizontally. We have no leaders or hierarchy. Since there’s plenty of work, all sorts of work, to be done, we’ve organised the task at hand around three types of bodies:commissions, working groups and general assemblies. The commissions and working groups operate independently.The commissions are structural and organisational and serve as tools for the movement (the Legal and IT Commissions are two examples). The working groups are platforms for collective thought, debate and research on specific subjects (we have working groups on subjects such as politics, the economy and the environment, for instance). These commissions and working groups are open to anyone who wants to participate. They hold their meetings in public spaces, announced in advance, and all their decisions are recorded in minutes that are published on line. They all organise around horizontal assemblies, but each group collectively establishes it own modus operandi, which is permanently open to change and optimisation. All important decisions made by these commissions and working groups are subsequently raised to the General Assembly for assessment and ratification by the movement as a whole. Hence, while our work gets done efficiently and independently, it is coordinated horizontally by our assemblies. In the virtual domain, we’ve created social networks and internet tools to enhance communication and pool our efforts. We use the N-1 social network and other tools to relate to one another and we have our own websites:takethesquare.net (international), tomalaplaza.net (national) and tomalosbarrios.net (neighbourhoods) and we use Twitter and Facebook for greater visibility and to reach all the nooks and crannies in cyberspace. • A list of some of our commissions is given below. − Communication is actually a compendium of several sub-commissions. Two of its primary tasks are to interact with the media and publish information on websites and social networks. Its Translation Sub-commission helps convey movement-related developments around the world. − Outreach encourages other sectors, communities or social actors to join us: universities, neighbourhood associations, worksites. This commission also liaises with other campgrounds and assemblies, providing support and encouragement locally, nationally and internationally. − Legal Affairs furnishes the movement with legal counsel, explaining its legal status, mediating with the police and identifying possible legal risks in the proposals put forward. − Group Dynamics prepares the methodology to be followed in assemblies, drawing up the agenda and establishing moderation arrangements, floor times and systems for taking the floor. This commission also drafts the General Assembly minutes. − Information installs and mans street stands to provide interested citizens with information on the movement. − Action organises in-house activities (conferences, meetings, recreational-protest events) and plans action for raising awareness, providing public information or exercising political pressure. − Internal Coordination coordinates the commissions’ work. It attempts to compile the decisions reached by all the M15 commissions and convey them to the information stands. It also coordinates logistical information on all the 15M commissions (such as where they meet and the contact person for each). – Analysis reviews the movement’s internal and external discourse as well as organisational issues and the ways it expands. Its task is to compile, analyse, convert, systematise and subsequently re-launch information. Other commissions focus essentially on the campgrounds and their needs. − Infrastructure provides the material resources required for campgrounds and activities outside their bounds: tarps, workstations, use of space, information stands, electricity (generators) and latrines and showers, to name a few. Many of these resources are donated and distributed under principles of self-management. − Respect attempts to maintain a peaceful and respectful environment, mediating in the event of incidents or provocation and preventing potential risks. Its force is verbal only: its task is to explain and persuade, while conveying the importance of a respectful campground atmosphere. − Infirmary provides first aid where required and stocks and manages medical supplies. − Food takes in and manages the food donated and establishes shifts for meals. − Cleaning organises schemes to keep campgrounds clean and healthful. It is not a cleaning service: we’re all responsible for cleaning up after ourselves. Young residents prepareto sleep in Habima and Zion Squares, in demand of government reforms on housingprices.